Homeowners have been making the choice for decades, deciding whether to fit out their new home (or freshly renovated home) with tailor-made custom window furnishings, or ready-to-fit products purchased from the store. Are you currently having trouble making this decision? We can help simplify the process by looking at the 3 most important points to consider when comparing custom and ready-made blinds. Custom-made blinds are known to be a high quality product, made by a window dressing professional to suit your exact specifications and needs. With custom-made products you can expect quality materials and workmanship, and an item that will last for years to come. If your custom-made blinds are not functioning as they are supposed to, or the end result is of a poorer quality than you anticipated, you will be able to speak directly to your supplier – something you can’t do with products purchased straight from the shelf. It’s a well-known fact that less expensive products generally use poorer quality materials. Using cheaper materials allows manufacturers to keep costs down. With custom-made blinds, professional installation will be included in your price. Your custom supplier will have the right tools and skills to complete your installation, with years of experience on the job. Ready-made blinds can be easy to install, if you know what you’re doing. You may need to drill holes for brackets – be sure not to drill in the wrong place, damaging the blind or much worse, your walls. If you’re an experienced DIY-er, this may not be an issue for you. If you’re not, consider whether it may be worth paying for custom-made when installation by a professional is included. Lastly, but definitely not least important, is cost. What is the difference in price between custom-made blinds and ready-made. As we’ve already discussed, custom-made blinds are more expensive than ready-made. However, with custom-made you know exactly who is making them, and where. Being made in Australia, you’ll know that they meet all Australian standards, including safety, fire and fabric standards. Most ready-made blinds are made overseas, so the manufacturer standards are different to Australia. This can also mean that parts are hard to source or cannot be sourced at all. Consider how you’d replace the blinds if they break or are damaged. 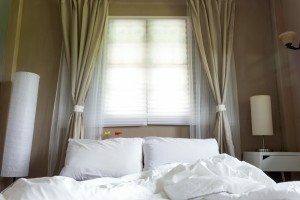 We hope this has shed some light on the key differences between custom-made and ready-made blinds. To talk to the experts in custom-made window coverings, contact Modern Blinds – a professional consultant will be able to answer any questions you may have. *Please note: ready-made blinds aren’t available in every window size, only standard sizes.